Update: For information on the 2017 Spray Pad Season Information, click here. 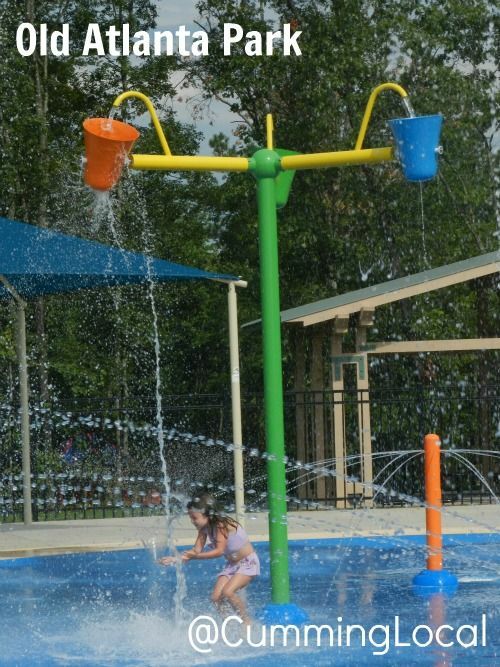 Forsyth County was busy opening four new parks in June 2012. One of those parks was Old Atlanta Park located at 810 Nichols Road in Suwanee (Forsyth County). The park is directly across from Lambert High School. 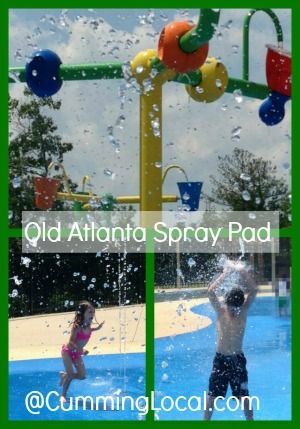 And possibly most exciting for our family & many others in Forsyth County … a Spray Pad! The Spray Pad will be open seasonally. Hours of Operation may vary each year. Closed on Monday for Maintenance & Private Rental. Daily Admission – $2 per person (one year & up). Adults are free if you stay in the “dry area” (basically meaning, if you don’t plan on joining in the fun). WooHoo!! How fun is this! The Spray Pad area is all fenced in. No deep water to worry about. Same day re-entry is allowed by simply asking for a wrist band at time of exit. Bathrooms are convenient & located inside fenced area. Pavilions are very close. While you can’t bring food inside the Spray Pad area, you could leave a cooler in the car & have a snack or lunch at the Pavilion. At time of posting (July 17, 2012) there was very little seating in the “dry areas”. Consider bringing a chair or blanket to sit on. However, there is plenty of space so maybe additional seating will be provided at a later time. At time of posting (July 17, 2012) there was very little shade in the “dry areas”. One large canopy thing & two large umbrellas. Additional shade in the future would certainly be nice – and again, this may be planned, but I’m unsure. Consider bringing a chair or blanket to sit on. Don’t forget your towel, sun screen, hat, etc. Bring a snack or lunch to enjoy in the Pavilion. Running around a fun spray pad for just an hour or so will definitely stir up some hunger! Make a day of it – the playground & recreation center are all in the same parking lot! For 2017 Hours, Admission and other information, click here. 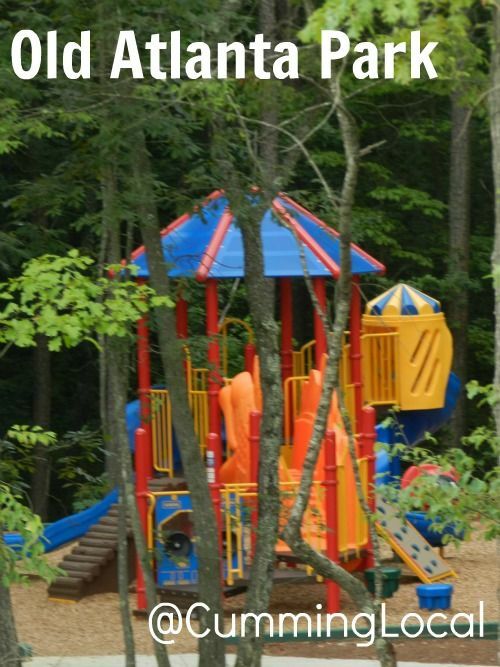 Click here for our thoughts on other Forsyth County Parks & Playgrounds. We love that place too! Thank you so much for posting this! After I saw your post we decided to take the kids there today. They had a blast and there were only 5 people there (including our 2). We will definitely be back (maybe tomorrow). I work for the company that manufactured the features for this Splashpad (Vortex). We are proud to have been part of this project and this Splashpad looks fantastic! If you would like a Splashpad for your community, we can help you!, please visit http://www.vortex-intl.com and contact us. Vortex is the world leader in Aquatic Play Solutions with over 5,000 installations worldwide! Very helpful information. Wish I had read this on Monday before we went and realized they were closed. We’re going to try it again today and plan to check out the playground too. Just wondering why the splash park has been closed for a week? Please add benchs to the playground area as well as a wider flat area to park strollers. Oh I didn’t know about that. That’s a bummer! And this is the last week it’s supposed to be open for the season too:(. I agree that more benches should be added … actually I think more shade covers too. Make sure to send those requests directly to the park and maybe if they get enough they’ll eventually add some. I love it too!! FYI: it’s not totally fenced in. The entrance/exit area has a space about 20ft wide that is not fenced and leads directly out to the parking lot. Plus, it’s around the bend, so if you’re tending to one toddler on one side of the spray pad, it takes about 3 seconds for the other toddler to make a bolt into the parking lot. It would be great if they could fence this section in.